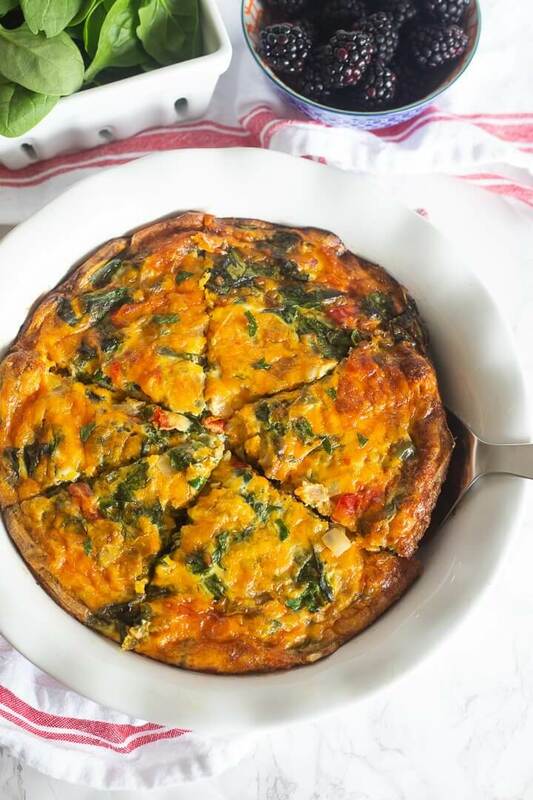 This sweet potato crust quiche uses a base of thinly sliced roasted sweet potatoes for the crust, and its filling is loaded with sautéed veggies and cheese! 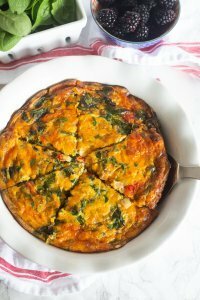 It’s a delicious, healthy, and protein-filled dish to make for a special breakfast or holiday brunch! Preheat oven to 375 degrees. Wash sweet potatoes, peel, and then dry with a clean towel if they’re still wet. Carefully slice into thin rounds with a sharp knife or use a mandolin, if you have one. Spray a 9-inch pie dish with cooking spray and layer sweet potato rounds in the bottom, overlapping heavily. Cut the remaining sweet potato rounds in half and use to line the sides of the pie dish. Drizzle 2 tsp. cooking oil over the top of potatoes and sprinkle with black pepper, salt, and garlic powder. Bake for 20 minutes until sweet potatoes are soft and beginning to crisp. While sweet potatoes are in the oven, sauté onion and bell pepper in 1 tsp. cooking oil. (If using frozen bell peppers, add near the end of the cooking time.) Once onion is soft, add spinach and stir until it wilts. Let cooked veggies cool. Whisk 6 eggs in a medium bowl and add milk or cream with salt and pepper. Stir in 1/4 cup cheese and cooked veggies. Once sweet potatoes have softened and are beginning to crisp, remove from oven and pour egg mixture over top. Sprinkle 1/4 cup cheese on top and return to oven for 28-30 minutes, until eggs are set. Let cool for two or three minutes and then serve. Note: *To prep in advance: sauté veggies for filling and cook sweet potatoes in pie dish the day before. The next day, beat eggs, add veggies, and pour into pie dish, then cook according to the directions.